Tell CEOs who attend Trump's Technology Council to #QuitTheCouncil now! In this moment in our nation, we will not forgot those who remained silent and we will hold special contempt for those who used their access and power for profit. In the wake of Trump's tacit response to Charlottesville- a response that has been applauded on stormfront- it is reprehensible that any CEO would continue to carry water for this administration. Under pressure from advocates like Color Of Change, Trump was forced to disband his Business and Manufacturing Councils after CEOs fled due to his dangerous policies. But a number of technology executives refuse to stop attending meetings of his American Technology Council, simply taking verbal stands against the Muslim ban and Trump's withdrawal from the Paris Climate Agreement-- but they won't formally quit Donald Trump's Councils. 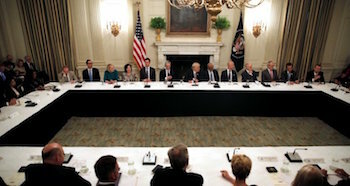 In the wake of Trump's violent policies, sending a tweet or press release is not enough--these CEOs must #QuitTheCouncil now and reject Trump's anti-human, anti-American administration now! This is not about politics. It’s not about Democrats and Republicans, or the political left and right. Trump is deeply harming Americans with his policies. His violent rhetoric and actions are bringing real life consequences for vulnerable families. No more! Tell CEOs to #QuitTheCouncil now! We are calling on you to stop attending meetings of Donald Trump’s American Technology Council now. Any cooperation with Donald Trump on business matters or otherwise, will be an endorsement of his hate-filled and racist rhetoric which runs counter to the family-friendly values of your company. We believe that it is in your best interest to quit the Technology Council before you and your company are indelibly sullied with the hateful and divisive actions of the Trump administration. Donald Trump ran a Presidential campaign based on repeatedly disparaging Latino, Muslim, and Black communities as well as women and people with disabilities with his hate speech, misogyny, anti-Muslim bigotry, and racism. And already, he has bested himself with his hateful actions in the Presidential office. Within the first weeks of his presidency, he passed a series of executive orders targeting vulnerable populations. During his Muslim ban implementation, over 700 people were wrongfully detained. As a company that prides itself on championing diversity and family values, we believe it is a great sign of corporate responsibility and decency for your company to ensure that your participation on the Council is not interpreted as an endorsement of these depraved tactics.